Videographer Mick Kalber released this video of an overflight of the East Rift Zone he took with Paradise Helicopters on Sunday, July 8, 2018. July 8, 2018 Lava Nears Ahalanui from Mick Kalber on Vimeo. The current Leilani Estates eruption of Kīlauea Volcano is now threatening Ahalanui Beach Park (Hot Pond) and Kua ‘O Ka La Charter School nearby. 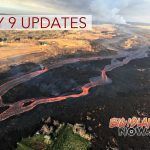 Pele has crossed the 1955 lava flow between the ocean and Highway 137 and this morning was about 300 to 400 yards from the hot pond and school. Reports from Paradise Helicopters’ pilot Sean Regehr say the flow is now within 200 yards. Apparently a blockage of the tube system in Kapoho caused the diversion and overflows from the lava channel near Kapoho Crater that have consumed most of the homes and buildings to the north and are now approaching the Ahalanui area. Numerous tongues of lava were threatening the are this morning. The enormous ocean entry across Kapoho Bay and the former Vacationland subdivision now has a two-mile-long flow front, with many plumes emanating from the lava pouring into the Pacific Ocean there. The source of the eruption upslope is, of course Fissure 8. Her [Pele the volcano goddess] output remains constant, although maybe a bit subdued this morning, but Pele continues to generate ten cubic meters of lava per second from this vent, somewhere in the neighborhood of 9 million cubic meters of lava every day. She sends her two-thousand degree fluid lava downslope in rivers, to the ocean entry some eight miles below. Earlier this month, hundreds of homes were destroyed in Kapoho Beach lots and Vacationland to the south.